Special Thanks to Aegous1 for making part of the banner! 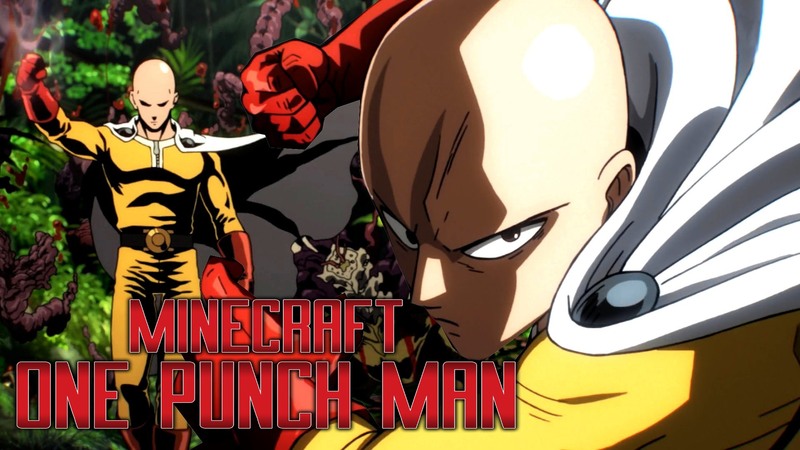 From the hit anime "One Punch Man" comes the new minecraft mod, "One Block Man". Fight against the monsters that appear in the anime and create your armor that allows you to defeat anything in ONE PUNCH. I am currently looking for some people to help me out, I'm looking for someone that can help animate some of the models that I and Reich had made, I'm also looking out for people to help me translate to different languages so this mod can reach an even bigger audience! If you want to help with that too, shoot me another message! I cannot give a date for the next update but i will ensure you, it will be big. Thank you for anyone who has had the patience to deal with my laziness, i promise the wait won't go to waste! -Log out then log back in and the extra one should be gone. -Saitama, Genos, Sonic, Tatsumaki, Vaccine Man, & Marugori. -Saitama's Armor allows you to take out anything in ONE PUNCH!!!! Please don't forget to tell me if you find any ones that are in different languages than the ones above! -Iaian, Stinger, and Spring Mustache! I do not own One Punch Man. Please do NOT redistribute my mod without my permission. Cool! i love it very much. I had an idea I'm not sure on the level of your coding ability but it would be a much better mod if you made it where in the sense everything was a lot more custom instead of potion effects and also if you made a way of training and lots of different possibilities to get as strong as Saitama by doing what Saitama did (Not gonna say incase you do not know the reason as to why he is so stronger) but then also add ways to maybe become a cyborg and such in a much more sort of "train" to get stronger instead of "put this armor on". I may try to implement these sort of features in the future, but for now, i will focus on items and mobs. Since it's still below version 1, i have plenty of time to add those features and i promise they will be added eventually. Can you add Saitama's Oppai suit? Maybe Can you add Boros, Gloryverse, Geluganshp, Melzalgald and Hammerhead. And thanks for you mod !! Thanks for the thanks. Also, Boros is going to be added, but not the others that you mentioned. First i will have to add Deep Sea King's minions, and mobs from the House Of Evolution. I might add the other ones you mentions in the update after next. Can you add other heroes from the hero association like metal bat, bang, King, etc to this awesome mod. I was thinking of doing that but i don't really know what purpose they would have in the mod as of yet. and thanks, glad you like it! Sure thing. As long as you give me the credit for being the creator of the mod, you can go ahead and do that. Okay I'll do that! Thank you!